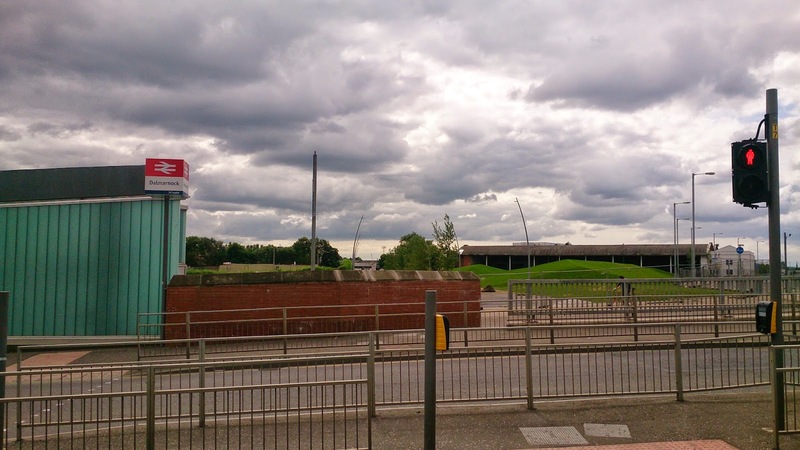 Last September I jogged a couple of routes around the Commonwealth Games venues as they were being made ready for the competition arriving in town. You can see what I found here and here. That was 9 months ago ad with the games starting next month it has clear that there has been a lot of changes since then. One thing which is noticeable in Glasgow is that all the fence painting, grass cutting, gap site tidying and road line painting that has been annoyingly neglected by the council for several years has been hastily sorted out as the city gets itself "dressed" for the expected arrival of visitors to the events. The council have described this as "getting the house tidy for visitors arriving" but I am kind of in the habit of keeping my house tidy for myself and fellow residents. Perhaps they could think about that. By all accounts the venues are coming together on time (if not exactly on budget). George Square has been fitted out with a giant Commonwealth Games logo, which seems to attract a steady stream of tourists with their cameras. When I passed it in a taxi around midnight the other night it also had a gaggle of late night revelers sitting atop it, so I do hope it has been built to withstand a bit of rough and tumble. 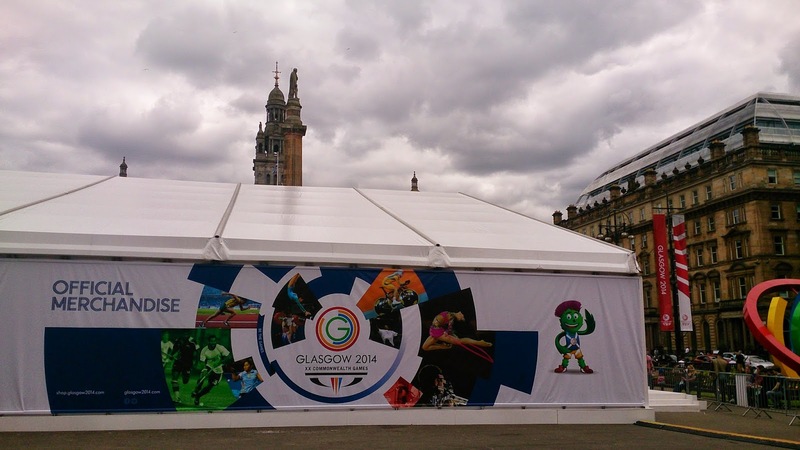 Just beside it the council have erected another of their big tents in George Square. I really do not understand why they do this. George Square can present a dramatic open vista for visitors and lunchtime office workers, a public civic space which is endlessly obscured beneath commercial ventures and funfairs. 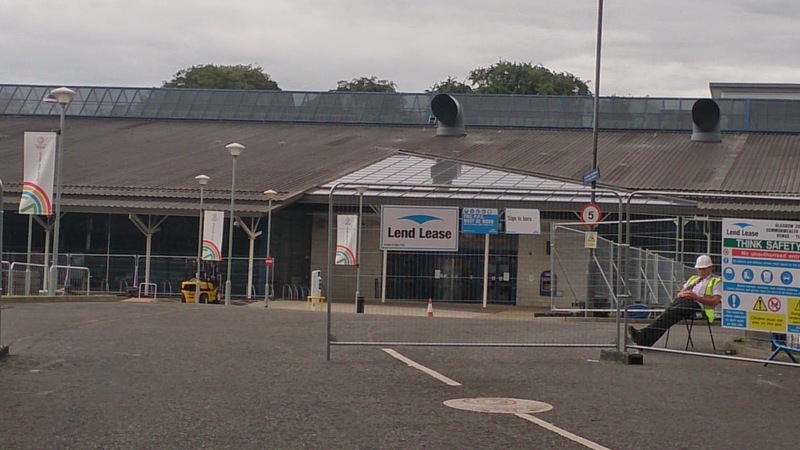 The current building is to be a Commonwealth Games Superstore, but with all the numerous empty shops in the city centre and the planned event space on Glasgow Green I really struggle to see what benefits there are to the city in shoving this ugly temporary building in this position. Another part of the city which has been dressed up for the games is the Kelvingrove bandstand. This 90 year old structure had fallen into disrepair but a successful campaign to raise the funds for renovation has led to it re-opening last month after refurbishment. During the games there will be regular cultural events held here, from concerts by Belle and Sebastian to screenings of Gregory's Girl. I was there last week at the Glasgow Mela and it was lovely to be again sitting in its amphitheatre enjoying the music and dancing. The bandstand is in Kelvingrove Park, beside Kelvingrove Art Galleries and Museum and the site of the lawn bowls competition in the Commonwealth Games. The city is full bowls clubs (this was my attempt to find as many as I could within a couple of miles of my front door) and this is presumably one event it was easy to shift tickets for. They have refurbished the greens which have stood for many years beside the Art Gallery building and are now installing temporary stands, although you can still access the greens and play on them free of charge at present if you so desire. 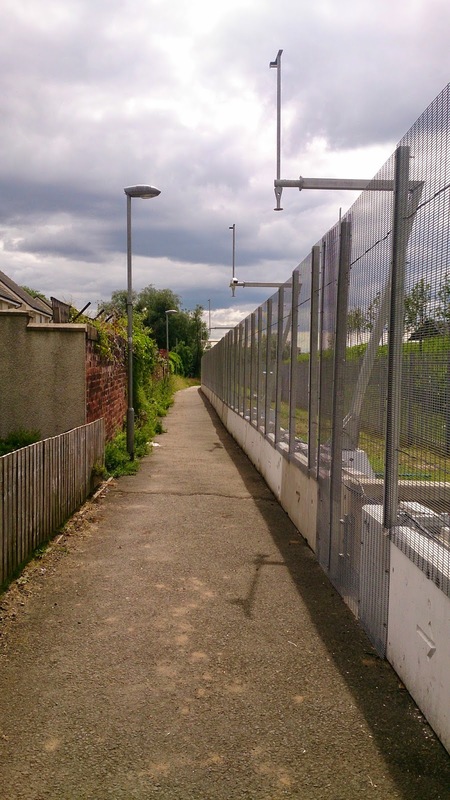 The stands mean that the usual access road on Kelvin Way to the Art Galleries car park is closed, and it can now be accessed via Dumbarton Road. 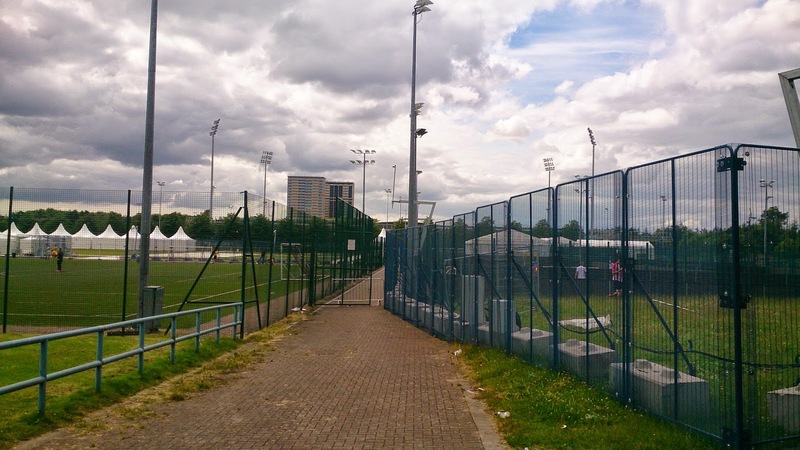 Despite the Scotstoun Sports Campus being the home to Glasgow Warriors rugby team and the Scottish National Badminton Academy, neither the rugby 7s nor the badminton events are being held here. However the table tennis and squash competitions will take place here. 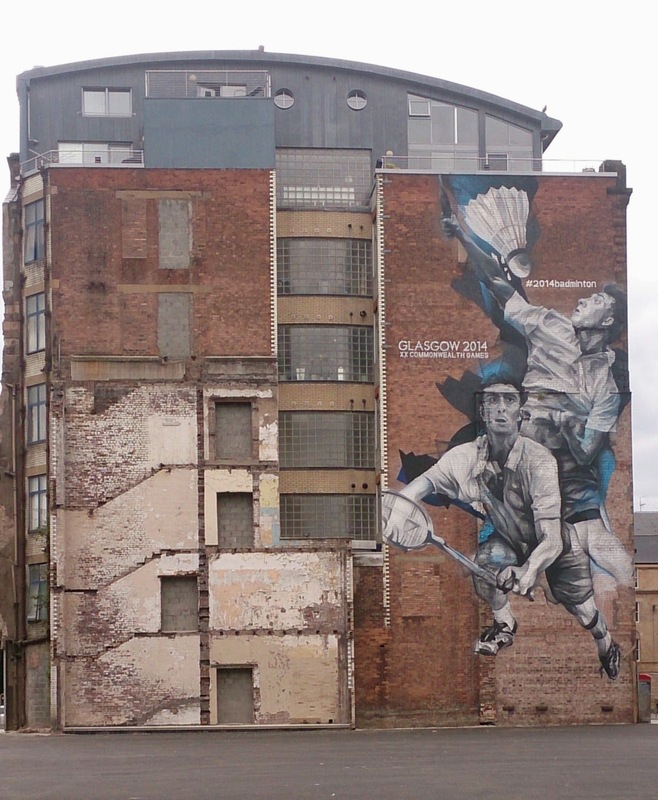 The use of a temporary structure to house the squash show courts has proven controversial, criticised for the lack of "legacy", not leaving Glasgow with a venue to host international competitions in future. This temporary building which has landed on the main astroturf football pitch at Scotstoun, is huge. There has also been the rebuilding of six permanent squash courts at Scotstoun which will still be left behind after the games, but this does seem like an expensive missed opportunity. On my previous blog, when I visited Scotstoun I had taken a misty-eyed photo of the old crazy golf course in Victoria Park, just beside Scotstoun Showgrounds. In September this was all crumbling, nostalgic and quaint. Now, as part of Glasgow "tidying the house" it has been bulldozed and landscaped. Limmy may note that some of the fences here have actually been painted and diggers were in giving the run down playpark a bit of a facelift today. The Hydro is a 13,000 capacity arena which opened in September 2013 and has seen continuous use with concerts and the like ever since. Last night Eric Clapton was playing there, but only managed half a show before storming off in the huff apparently. Another huddle of venues is to be found in the east end of the city. Glasgow Green is to host a variety of cultural events, opening and closing ceremony parties, as well as start and finish lines for the marathon, cycling time trial and cycling road races.Fences are at present being erected on the Green around the People's Palace area as they get ready. At the eastern end of Glasgow Green lies the Glasgow National Hockey Centre, two synthetic pitches built specifically for the Games and now the headquarters for Scottish Hockey. In the picture below it is now surrounded in fencing and more resembles a building site at present than anything else. Running around here today it is clear that there has been a lot of landscaping and turfing going on. Shabby gap sites which have been tolerated by the city council for decades are being smartened up. Celtic Park will host the Games Opening Ceremony on 23rd July 2014. The home of Celtic Football team since 1892. It was curiously picked by the SPFL as the venue for their opening game of the new football season on the 9th of August between Celtic and Partick Thistle. Predictably Celtic have decided it is too early to get the pitch ready for football. So this game has been postponed, which seems an avoidable hassle for Partick Thistle fans like me. The approach road to Celtic Park has a had a long overdue facelift, becoming the Celtic Way, it would appear. 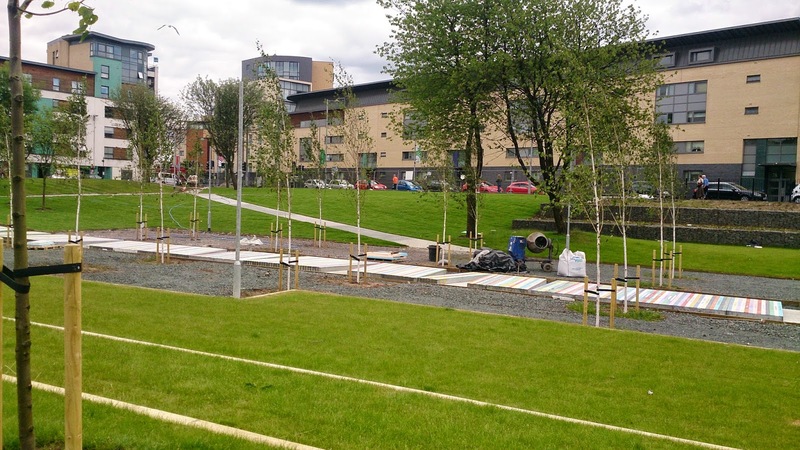 Across the road from Celtic Park is the new Chris Hoy Velodrome and Emirates Arena. This will host the track cycling and badminton events. I have been to see the UK Championships badminton tournament here and when Scottish competitors were playing a great atmosphere was generated. The athlete's village is also alongside here, creating housing in an area which has been for decades a bit of a post-industrial wasteland. This hasn't gone without controversy as some people were unhappy with the forced evictions and demolitions that occurred here, and the security fencing being erected is causing access difficulties for many local residents. 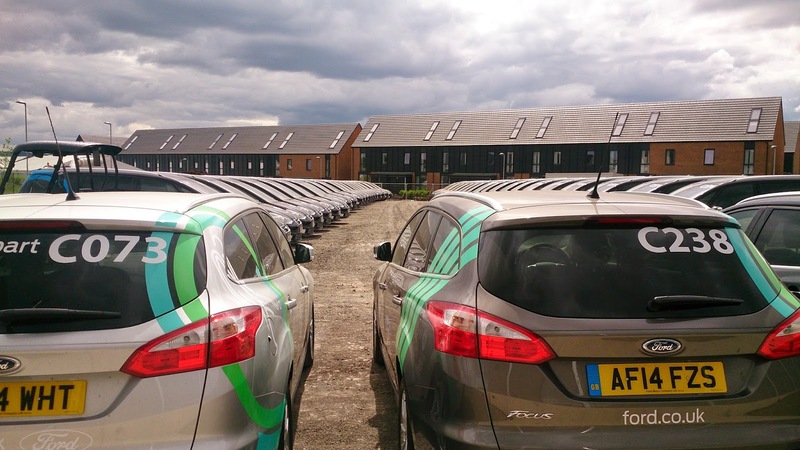 However I think most people will agree that this infrastructure investment will be one of the positive results from the Games. I worry though that we are making the same mistakes as previous generations in building houses first without creating employment or schools and corner shops for the future residents. Unemployment rates in the east end of Glasgow are as high as anywhere in the UK and I don't see any thought of "legacy" employment or training for the locals. We can't all work in the retail parks and new leisure facilities out here. The last venue in the east end is Tollcross Swimming Pool, which has always been Glasgow's 50 meter pool. Money has gone into upgrading the facilities here but like many of the other venues it is currently being surrounded in a ring of steel and resembles a building site again. Other venues I didn't visit on my wee runs this weekend are the mountain bike trails on Cathkin Braes just south of Glasgow, Strathclyde Park where the triathlon will be held, the Edinburgh swimming pool where the diving will be held and outside the cities there is the Barry Buddon shooting centre in Carnoustie. The road signs are up warning of the traffic hassles and parking restrictions on the way, but I think most Glaswegians are excited about the Games starting and ready to show off our city. It's meant to be fun, after all.